The world's biggest mobile phone makers and network operators have backed plans to create a universal phone recharger. Most manufacturers now produce chargers which work only with their own devices. The re-charger will consume 50% less stand-by energy than today's models, the GSM Association (GSMA), an umbrella group for the industry, said. Firms to back the plan include Nokia, Motorola, Samsung, Sony Ericsson, LG, T-Mobile, Orange, 3, AT&T and Vodafone. The majority of new handsets will support the re-charger by 2012. "This is a broad agreement that will move the industry to a single, energy-efficient charger for all mobile phones," said Michael O'Hara, marketing director for the GSMA. In a statement, Mitti Storckovius, director of environment, devices at Nokia said: "By supporting this industry initiative on common charging solutions, and enabling consumers to choose if they need a charger with every new device or can re-use existing ones, we can contribute further in improving the industry's environmental footprint." The micro-USB connector will be used as the common charging interface. 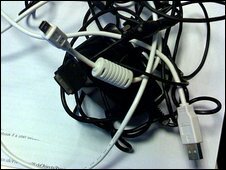 Manufacturers had been under pressure from the European Commission to produce a standardised charger. EU Industry Commissioner Guenter Verheugen told German radio station Deutsche Welle last week that there were more than 30 different kinds of charger in use across the 27-nation European Union. The GSMA estimates the new charger will mean the potential elimination of up to 51,000 tonnes of duplicate chargers.